Pizza became popular in American right after World War Two. GI’s who served in Italy had been exposed to the culinary delight and wanted more. At the same time, a large number of Italian immigrants were flooding into the Eastern and Midwestern United States looking for a better way of life that wasn’t available in their war-torn country. Yet by the 1980s what had started out as a love of delicious high-heat, wood or even coal-fired pizza, had devolved into 30-minute delivery specials with cheap ingredients supported by a soggy crust. In recent years “Food TV” and a love of quality has inspired people to start making their own, rather than paying for overpriced soggy imitators. If this sounds like you, then the Napoli Outdoor Pizza Oven should be on your radar. 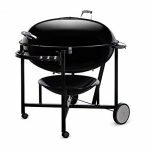 It has the ability to use charcoal, natural wood, propane, or even wood pellets as the primary heat source. However, it doesn’t come with the propane attachment, which costs extra. 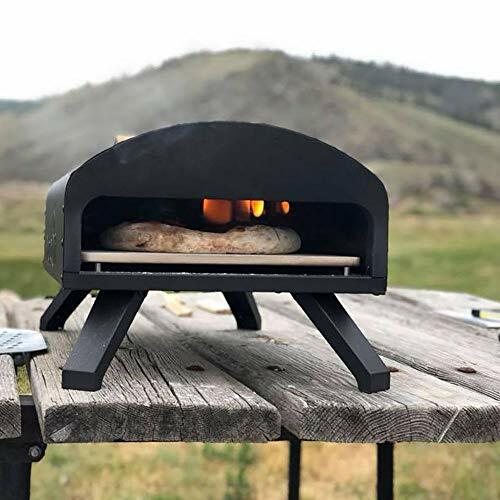 It also uses a cordite pizza stone, which is designed to absorb the heat of the fire and use it to bake a crispy crust. 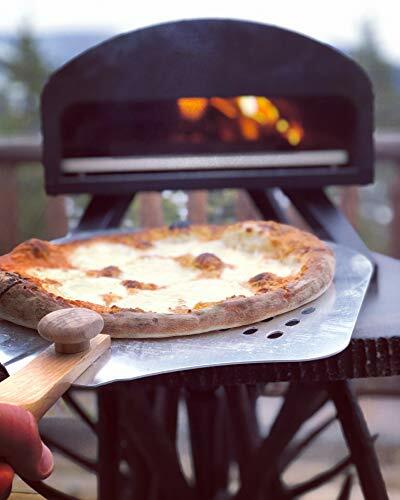 The Napoli Outdoor Pizza Oven was designed and built with quality in mind. One of the highlights of this is the cordite pizza stone. Now at first glance, you might think that one pizza stone is as good as the next. However, cordite has been proven to have a higher heat capacity and has far superior shock resistance compared to common stoneware. This means it can make the most of the staggering 850-degree maximum heat of the Napoli Outdoor Pizza Oven. Assembly is relatively straight forward and easy. It isn’t a very complicated device in the first place. One minor miss here though is that while it can be set up to run on propane, it doesn’t come with the attachment adaptor. 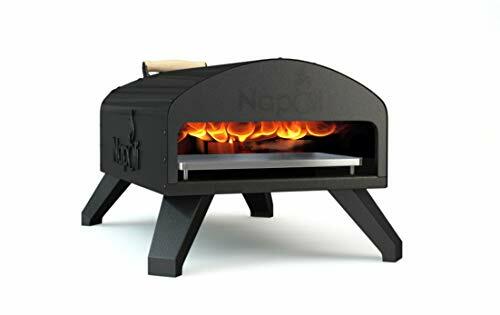 The Napoli Outdoor Pizza Oven is set up to run off charcoal, propane, natural wood or wood pellets. However, to use the wood pellets effectively, you really do need to buy the propane attachment. There is some argument here about personal preference. Purists will tell you that you absolutely need to use wood and nothing else. This is a bit inconvenient just for the flavor. If you want true high heat, as well as some nice smoky flavor, I would recommend ponying up the money for the propane attachment. Then you can let the propane fire do the work of maintaining a consistent level of heat. You can then augment with lump charcoal to bring the maximum smoky flavor. When it comes to the temperature range, Napoli boasts crazy high numbers like 850 or even 930 degrees Fahrenheit. Yet, you don’t really need to get it that hot to make pizza. Those numbers are more for things like smelting lead! 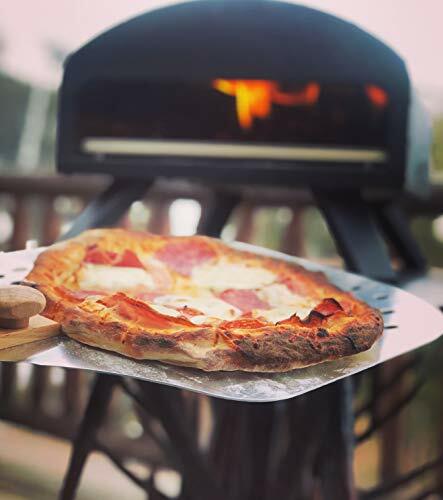 A 450 to 500-degree temperature range is better for fresh homemade pizza. You can use an infrared instant-read thermometer to tell you the temperature of the air and the pizza stone. When it comes to making fresh pizza, the dough is the thing that matters most. Ideally, you want your dough to have a higher water content than say the recipe you use for baking homemade bread. This will crisp up better, and allow for more air space, to retain moisture. A dense dough will harden and transmits heat to a degree that it can burn the ingredients rather than bake them. You will also need to invest in a quality pizza peel. There are purists out there who insist that you absolutely must use a wooden peel. Still, a metal peel with a wooden handle will make it much easier to transfer the pizza to and from the cordite pizza stone. Now the transfer itself is a bit of an art form. There are some people who seem to be born with a special gene that allows them to slide a soft, malleable fresh dough pizza from peel to stone with little more than the flick of a wrist. However, this can take some time and experience to develop. 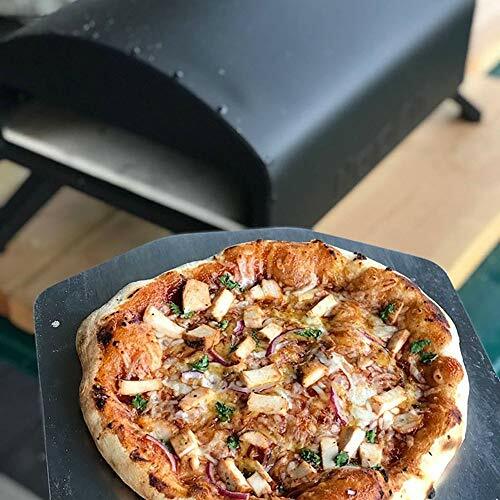 If you are going to stay under 600-degrees, you can spare yourself the struggle and potential heartache of a sloppy dough spill, by simply making your pizza on a sheet of silicone-infused parchment paper. Then you can just lightly tug on the parchment paper to transfer it. When it comes to toppings, try to take a minimalist approach. The more ingredients you add the longer it will take for the middle of the pizza to get done, which could lead to burning on the outer edges. In Italy pizzas generally, have three ingredients or less. Cheese selection can also be a factor. Pre-shredded mozzarella has additives to keep the strands from clumping. This also limits the cheese’s ability to melt efficiently. If possible buy a block of mozzarella or ideally use fresh, wet, buffalo mozzarella. The cordite pizza stone in the Napoli Outdoor Pizza Oven will handle a 12-inch diameter fresh dough pizza. 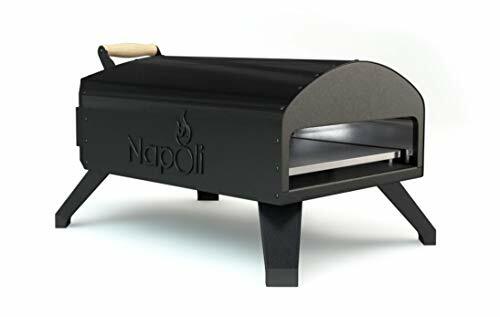 Assuming you make a clean transfer from the peel to the cordite pizza stone, there is very little cleanup involved with the Napoli Outdoor Pizza Oven. 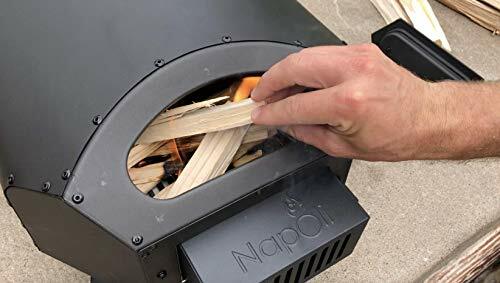 If you are using wood, pellets, or charcoal, you will need to clean out any ash and leftover embers after every session. 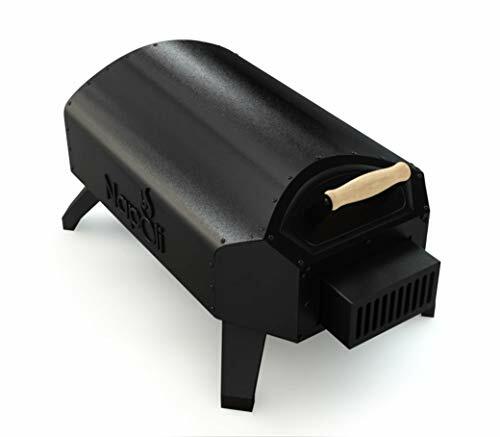 The Napoli Outdoor Pizza Oven comes with a 1-year limited warranty. 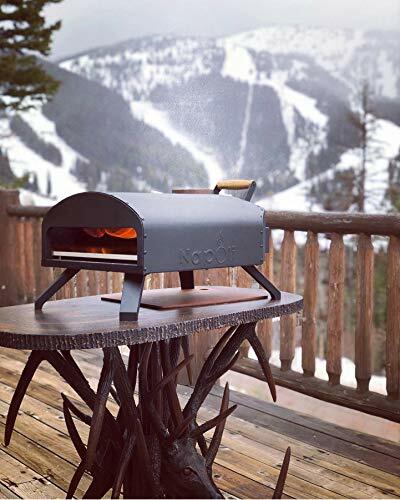 If you love or are simply curious about making your own wood-fired pizza, the Napoli Outdoor Pizza Oven will get you about as close as possible to the traditional thing you would find in Naples, Italy. It’s a pity that it doesn’t come with everything you need to run it on propane, but it’s worth the little bit of extra money for the easy, consistent heat.